A little over 100 years ago the World Missionary Conference in Edinburgh (1910) was a prophetic foretaste of a century-plus renewal of Christian ecumenism, a renewal that has proved to be quite substantial on many different levels. If the truth is told I believe we have made more progress than the participants at the famous Edinburgh Conference imagined at the time. I also believe the last century is a prelude to what is to come in the decades ahead. We must begin by stating the obvious–full visible unity between the various Christian churches and denominations has not been realized. Nevertheless, Catholics, Protestants and the Orthodox have all found ways to reach new levels of understanding and mutual respect. Christians in the global Anglican Communion, to cite but one example, have made significant contributions as a via media (middle way). Even a growing number of voices within the Free Church communions have joined this dialogue. One could say that a rapprochement has been reached that would not have been seriously thought possible at Edinburgh. The World Council of Churches (WCC), birthed in 1948 as a result of several major developments that followed 1910, has made a major contribution to global ecumenism but the WCC is now struggling to regain the vitality it enjoined in the 1960s. Until a way is found to include the Roman Catholic Church – as well as the Pentecostal, Charismatic and Evangelical churches – the catholic church around the world will not address the problems and possibilities of the new millennium with a renewal of Christ’s love. Some have, rightly I think, suggested that the WCC needs to “reinvent” itself. I totally agree. The world of our day has to face new challenges, new problems and new possibilities. The rise of globalism, something that the churches have never faced in the history of Christianity, now makes local issues global and global issues local. Following Vatican Council II Roman Catholics finally began to engage ecumenism in a way not possible since the early centuries of the church. Eleven important bilateral dialogues have taken place in recent decades. These dialogues have included Catholic discussions with Lutherans, Methodists, Anglicans, the Reformed, Eastern and Oriental Orthodox churches. They have also included the Baptist World Alliance, the Disciples of Christ and the Mennonites. Over the last five years I have shared in some of the fruit of these different dialogues and been allowed to see first-hand the great benefit of these discussions and the way they contribute to a growing love and deeper trust. One of the longer bilateral dialogues has been between Roman Catholics and Methodists. This conversation is called the Methodist-Roman Catholic International Dialogue. In the recent book, Celebrating a Century of Ecumenism: Exploring the Achievements of International Dialogue (Eerdmans, 2012), Geoffrey Wainwright, a world-renowned Methodist scholar and close friend of missional theology, offers a history of this dialogue. (Wainwright is also a major missional thinker and was closely associated with Lesslie Newbigin, one of the great leaders of the missional theology movement!) A response to Wainwright’s analysis of this dialogue is provided by a Catholic friend of mine, Sister Lorelei Fuchs. Wainwright offers a moving history of one of the longest running Catholic-Protestant dialogues. 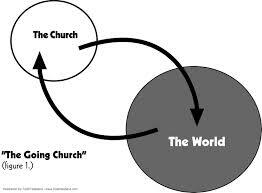 He focuses on the Seoul Report (2006) with the theme: “The Grace Given to You in Christ.” He suggests that a convergence is taking place in ecclesiology, a convergence rooted in our common mission. This gets at the missional concerns I have written about the past few days. I will expand upon this convergence in tomorrow’s blog. Thanks for these posts, John. They help me be hopeful about the church’s witness. Jim Rehnberg liked this on Facebook.